In February, Fishers launched the state's first "internet of things" lab to serve as a collaboration hub for companies, entrepreneurs, developers and others interested in connecting products to the internet that historically haven't been linked. The idea of connected products—whether a diesel engine, a hotel room door or a washing machine—is proliferating across various industries, and the Indiana IOT Lab-Fishers will help advance the IOT sector in the state, according to ClearObject CEO John McDonald. But it's not the only piece of the effort. "That's not enough alone to collaborate," McDonald said in an interview following IBJ's Technology Power Breakfast, held Thursday at the Indianapolis Marriott Downtown. "The other thing that you need to have is capital." Internet-connected products can benefit both the manufacturer and the end-user, as devices collect data, send alerts and act on predicted user needs, such as automatically ordering new filters for a connected HVAC system. But it takes a lot to create and manage such products. It takes experts who write the software, design the user interface, and establish security protocols, among a host of other things. McDonald said many local companies don't have that expertise in-house. "The good news is that in Indiana, we have lots of companies, including our own, that can play in pieces of that story," he said. ClearObject, formerly CloudOne before a name change in February, recently evolved from a niche cloud-services firm to an IOT company with a variety of offerings. The Fishers facility may be the first of many labs that appear across the state, and they'll be a convening place for IOT outfits and manufacturers, McDonald said. But money will be an important catalyst for bringing products to life. Capital could be in the form of internal project budgets, external venture capital, or "tax credits that the state could use for research and development," he said. That money is akin to oxygen for the emerging sector. "Everything we do today, in somewhere between three and seven years, is completely obsolete," he said. "If you wait for the normal business cycles to carry you forward, you don't get enough ability to optimize that tech and the value of it in the marketplace before it's gone." Mark Lawrance, who's vice president of engagement and innovation at the Indiana Chamber, said he thinks legislators are going to play an important role as community leaders rally around the idea of integrating the internet of things into manufacturing, agriculture, and logistics. And a lot of his work at the Chamber involves educating lawmakers. 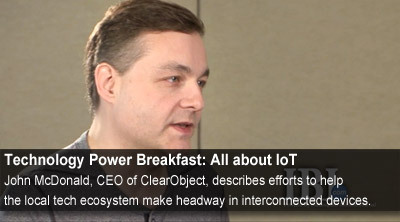 "I think the internet of things is exciting and challenging," he said during the Power Breakfast panel discussion. "It's good for both early stage and entrepreneurial businesses, but how do current businesses reinvent themselves and take advantage of that?"